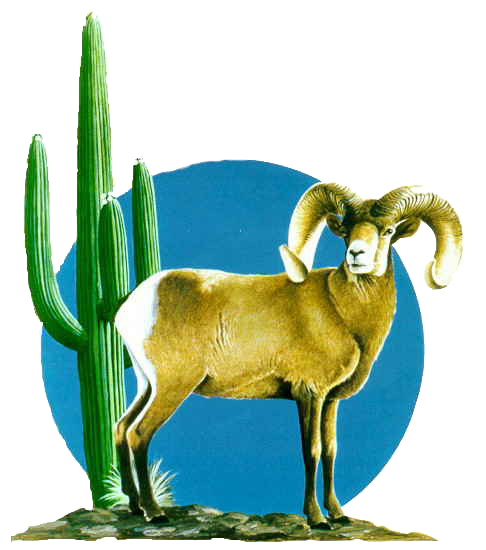 The Arizona Desert Bighorn Sheep Society was formed in 1967 as a single purpose organization dedicated to the conservation and population enhancement of bighorn sheep in Arizona. The Society has since grown to include over 1100 members and also works to preserve Arizona's growing herds of Rocky Mountain bighorn sheep. When our organization started, sheep numbers were in serious decline. Today, thanks to our efforts, we are proud that the bighorn population has shown a five-increase since 1967. The mission of the Arizona Desert Bighorn Sheep Society is "to promote the management of bighorn sheep and increase their population in the state of Arizona." When the Society was originally formed, its sole emphasis was on desert bighorn sheep. In the past several years, however, a significant population of Rocky Mountain bighorns has been established in portions of eastern Arizona, and our efforts now include that species as well. The Society's ultimate goal is to establish viable, self-sustaining bighorn sheep populations throughout all suitable portions of their historic range in the state.